19°C, sunny with brisk S wind. I rode Raleigh Mustang with MapMyRide+! Distance: 62.68km, time: 03:00:20, pace: 2:53min/km, speed: 20.86km/h. In a word- versatile. On its first outing, I went on trail, road, beach and canal. This bike handled all with ease. It was a good choice. As for the ride, I sampled every terrain: road, towpath, gravel trail and beach. The Southport Air Show interrupted the route. Passing through the town, I looked down a side street, above a Lancaster readily moved south. 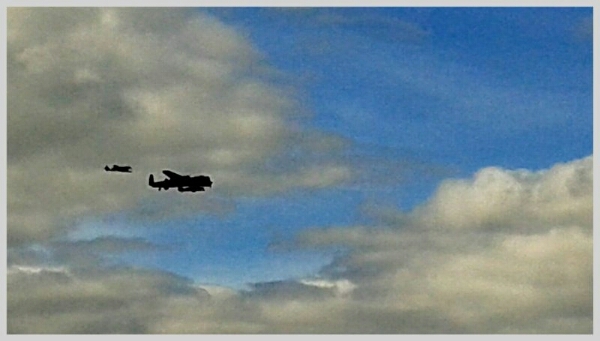 A Spitfire and Hurricane was there too, so I turned towards the sea. Plenty of other people gadwtgd same idea. The big bird flew up and down a few times and eventually left to the north. Visibility was crystal clear, Blackpool Tower seemed closer than ever. Back on the bike and to the north end of the beach, a chance to ride on the sand. The sea seemed to have gone all the way to Ireland. A small jet whizzed overhead. A friendly looking couple used kid beach as their viewpoint. I asked “is that a Mig 15?”. They thought so. Never have I seem one in the air before. On the ground, they are tiny.My mission for the day was still incomplete, the bike shop. On the way back to base, the route crossed a canal and the towpath appeared inviting. There were fewer fishermen than usual. That’s good because they have an annoying habit of blocking the path with very long poles. Wind blew strong. I was a bit disappointed by the milage (39 miles) but I did sample the thrills of an airshow. This entry was posted in Cycling and tagged adventure bike, airshow, canal towpath, gravel bike, Southport. Bookmark the permalink.